"I use leftover turkey for this quick salad with all the right textures. The raisin sweetens the salad, the sunflowers add a crunch, and the turkey is the heart of the salad." 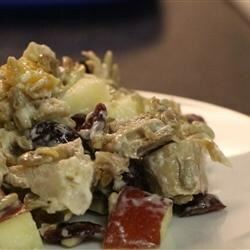 In a salad bowl, combine the turkey, sunflower seeds, raisins, apples, mayonnaise, salt, and lemon juice; mix well. Refrigerate at least 2 hours to blend flavors. Very tasty salad~ Had to add extra Mayo for creaminess though. I make a similar salad with toasted pecans and craisins. Great recipe. I used seedless grapes instead of raisins. Made it exactly as written, and it was a huge hit. Everyone, even the pickiest of eaters, loved it. My husband liked this a lot, and it's a nice change from tuna salad. Next time maybe I'll try it with the craisins and nuts instead of seeds, as others mentioned.